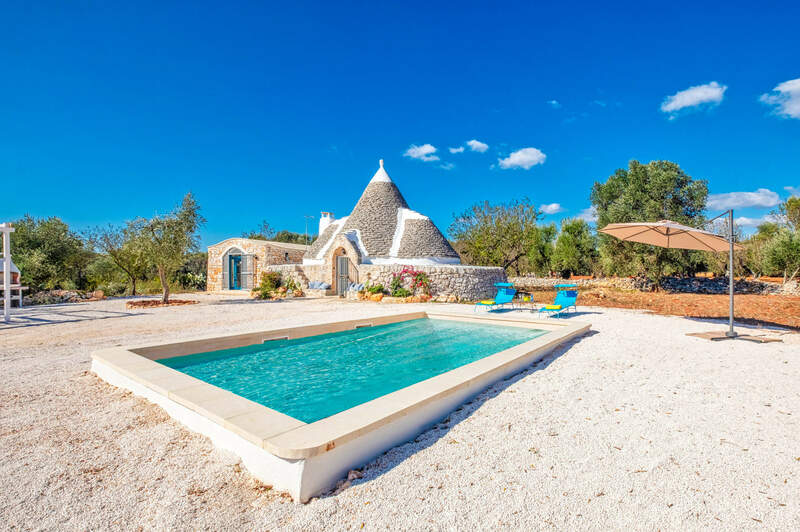 Ideal for a romantic getaway, Trullo Didi is an authentic 1 bedroom villa in the Pugliese countryside only 5 minutes' drive to the stunning town of Ceglie Messapica. Built in a traditional-style trullo, a small round house with a conical roof, it features the original cones, alcoves and small stone windows. There is a private swimming pool and outdoor dining, with plenty of space to relax in the sun and enjoy the surroundings. Pool heating, WiFi and air conditioning/heating in bedroom is included. Traditionally stone-built trullo with only 5 minutes' drive to the town of Ceglie Messapica! Your very own charming romantic escape! The swimming pool is surrounded by white gravel, olive trees, almond trees, figs and prickly pears which you can taste. There is plenty of space to relax on the sun lounges by the pool - the ideal place to enjoy a glass of wine or limoncello with a good book. On the other side of the pool, Trullo Didi offers a wooden pergola for true al fresco dining experience with a dining table and chairs plus a brick BBQ for long summer nights. This is the perfect shaded spot to enjoy a cool drink while admiring the gardens. A short driveway takes you to an entrance edged with massive local stones, there is plenty of space to park your hire car. From here you reach the front door. The living space is inviting and full of character with open stone walls and floor and curved ceilings. It's furnished with a flat screen TV, a seating area into the alcove, and a dining table with chairs. To one side there is a fully equipped kitchen with modern facilities including a dishwasher. There is 1 double bedroom set under the roof cones, with an impressive curved high stone-celling with storage space in the wardrobe and set of drawers. A set of steps down from the back of the bedroom leads you to the shower room which is also in the country style of the Trullo. There is direct access to the pool terrace through a huge glass door which floods the room with light. The picturesque town of Ceglie Messapica is only a 5 minutes' drive away with its narrow-paved streets and lively Piazza Plebiscito. You can enjoy the traditional Italian restaurants serving fresh pasta, pizza and gelato. Relax in the evening at one of the bars serving delicious cocktails and snacks. Well-known for its whitewashed town, Ostuni is only a 20 minutes drive, with its elegant houses, churches and plenty of places to have some lunch or dinner. There is a weekly market on a Saturday in Ceglie Messapica, where you will find everything from fresh fruit, vegetables and local produce to clothing and souvenirs - so why not stock up for a BBQ back at the villa? You will also find a supermarket here for all your holiday essentials, as well as a butchers, bakeries and pharmacy. The main square of Ceglie Messapica, named Piazza Plebiscito, is dotted with restaurants which serve homemade orecchiette pasta, and gelato with figs and almonds. There are also small bars serving Italian coffee and breakfasts, as well as a few cocktail bars. The town has a great reputation for food and every August it holds an annual food festival. The Puglian coastline and beaches are renowned for their beauty and crystal-clear waters. You can either visit one of the private beach clubs where sunbeds are available for hire or explore the small coves which have limited facilities but plenty of charm. Both Spiaggia di Vallanova and Quarto di Monte beaches are a 30-minutes' drive away from the villa. Alternatively, the beautiful Torre Guaceto National Park, 40 minutes' drive away, is a protected landscape with dunes, marshes and stunning sea views. At Torre Guaceto National Park, you can hire snorkelling equipment or bikes to see the area in depth and at a leisurely pace. About an hour's drive north is the theme park of Fasanolandia which has a number of rides and a safari park as well. Or within a 45 minute drive you will find AcquaPark Egnazia, which has plenty of waterslides for the whole family to enjoy. Ceglie Messapica, with its white painted alleys and cobbled streets, is a charming place to visit. Further afield, the nearby towns of Locorotondo, Ostuni and Cisternino are all within a 30 minute drive and are well worth a visit as each has it's own charm and attractions. Alternatively, Alberobello is a 40 minute drive away, where you can wander the cobbled streets between the trulli which this town is known for. Considered one of the best golf clubs in Italy, San Domenico Golf Club is located 40 minutes away. Take a look here at the Puglia villas that are currently on sale. Villa Trullo Didi is not available to book for season as it is sold out. Take a look here at the Puglia villas that are currently on sale. Set on top of a steep hill with excellent views of the surrounding countryside, Cisternino has a couple of distinctive features. Its shops are more focussed on the arts with many galleries and specialist suppliers including an upmarket chocolatier in the main piazza. The other is the high number of butchers’ shops which run a lucrative side line by becoming restaurants each evening. Simply choose from the large selection of different types of meat and it will be taken away and grilled over a wood fire for you. A truly unique experience. The most popular of the white towns of the region, it’s located on a hill facing the sea with a mixture of wide open piazzas lined with cafes and restaurants and narrow streets and alleyways, ideal for wandering and finding souvenirs. At the heart of the old town is a very impressive cathedral decorated outside with Baroque era carvings. Climb a short way up the slope past the cathedral to admire the ornate 18th century bridge which links two parts of a former palazzo. Alberobello has around 1,400 trulli, the distinctive houses with conical roofs for which the region is famous. The 'Trulli Zone' of the town spreads up a hillside and is perfect for strolling around, taking photos and shopping for souvenirs in the many gift shops. There is a small museum explaining how life would have been lived in a trulli. A charming town, reputed to be one of the most attractive in all Italy. It’s lovely place to stroll as the sun begins to set and a joy for photographers to capture the cobbled, flower lined winding lanes and golden stone of the finely carved Baroque buildings. A few restaurants have a prime view towards nearby Martina Franca and the Itria Valley. The San Domenico is located by the Adriatic Sea and is considered the best in Italy. This 18 hole championship club measures over 6300 meters, has a par of 72 and has been constructed to the highest standards, with greens conforming to USGA Specifications. During the summer from June to September, Acquapark Egnazia offers a fun choice of water slides, a lazy river and two pools for playing and splashing. You can also hire sun beds and umbrellas to relax in the sunshine.